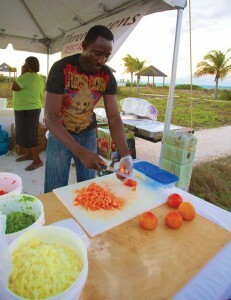 Times of the Islands – Island Fish Fry: Be There! Island Fish Fry: Be There! The Turks & Caicos Tourist Board, in collaboration with the Department of Culture, DEMA and major presenter LIME, kicked off the event in late January, 2013. It has been growing week by week, enticing locals and visitors to experience an evening in the park in a fun, family style setting. Fresh and colorful local food, with specialty menu items from native restaurants, is served up every Thursday night in The Bight Children’s Park at Island Fish Fry. The aroma of fresh fish frying permeates the air, while visual treats abound with vats of boiling lobster and conch salad masters plying their craft. Plates loaded with crab ‘n’ rice, lobster mac ‘n’ cheese and local island corn straight off the grill sit in front of hungry patrons relaxing on park benches under starry skies. Local restaurants come from all corners of the island and include Froggie’s on da Beach, Kay Jo’s, Miss Moonies, Upstairs Bar & Grill, Hole in the Wall, Smokey’s on da Bay, Cactus Bar & Grill, Uncle Dough’s Salad Bar, Middle Caicos Café, Bugaloo’s Conch Crawl, Doreen’s Place, Sailing Paradise, Native Cuisine and Three Queens, with each offering up their specialty menu items and the opportunity to try one or all. Each week a new band takes the stage with rotations by local favorites Lee & the Force, Sea Breeze Rip Saw Band, Keno & Kazz Alroy & Daz, Kew Band Lynx and V6 Rake n Scrape Band to bring a variety of styles and sounds. Cultural acts are interspersed throughout the evening with performances by the Breezy Beach and Edward Garland Youth Centre Dancers. The National Trust displays their wares and students from various youth enterprise groups bring locally handcrafted items for sale. “Henry the Conch” makes his appearance; folkloric storytelling and skits, maypole plaiting and instrument demonstrations showcase all that is TCI surrounded by a culturally enhancing monologue by Director of Culture David Bowen. Local school and church groups are also on tap to perform. A junkanoo rush by “We Funk” brings the crowd to their feet with many in the audience joining in to dance to the symphonic booming of the drum and scraping of the grater. For more information visit www.turksandcaicostourism.com or call (649) 946-4970.
we will be on salt but where is the fish fry?